It’s hard to be inspired to cook in these winter months. It’s like “OK pumpkin, you’re overstaying your welcome.” And “I get it root vegetables, you’re earthy and delicious. Yawn.” Even harder is getting in your salad greens! Lettuce doesn’t exactly warm the soul after trudging through the slush in single digit temperatures. But hold off on ordering that pizza, I’ve got a remedy! Dress that salad in something warm and inviting. And to sweeten the deal, this dressing has only 2 ingredients (well, 3 if you count water, but stop nitpicking!) Obviously you can just make the salad and dressing and it will be ready in mere minutes, but if a hearty salad is your heart’s desire then the whole shebang comes together easily. The beets humbly roast away with minimum prep as the tempeh marinates. You’ll really only have 15 minutes or so of hands-on time and then earthy, tangy, smoky, sweet flavors will be all yours. In the meanwhile, you can warm yourself with other activities – like a bubble bath or stoking the fireplace or searching the internet for deals on tropical vacations. What? That Mac balanced on your lap gives off some heat, don’t pretend you haven’t noticed. If you don’t feel like having the Smoky Tempeh Croutons, some toasted pecans would be great in this, too! Preheat oven to 425 F. Wrap beets in tin foil and roast for an hour. Remove from oven, unwrap and slice when they stop steaming. Mix all marinade ingredients together in a bowl. Add tempeh pieces and marinade for an hour. Preheat a large cast iron pan over medium-high heat. Remove tempeh from marinade and saute in a little olive oil or cooking spray. When they’re browned (about 7 minutes) splash in some extra marinade and toss to coat. Remove from heat. Mix everything together in a bowl. When ready to serve, microwave for 30 seconds or gently heat in a pan over low heat. Place the greens in a super large mixing bowl. Drizzle in the dressing and use tongs to coat. The greens will wilt slightly. Transfer salads to 4 plates (or two, if you’re looking for entree-sized salads). Place slice beets snugly against the greens. Scatter on tempeh croutons and a few slices of sliced red onion. What’s stoneground mustard? Does the UK get that? Can wholegrain mustard be subbed? You can’t go wrong with roasted beets. Wow, this looks and reads to be absolutely delicious! Actually, I can totally do this right now. And should, because the beet is getting a little flimsy in the fridge. Roasted beets are definitely overlooked winter food. This looks great! Wow…….the salad looks so amazing…. ! this looks great, but, what is liquid smoke? and is it healthy? I just bought the ingredients for this at the market: wild arugula and beautiful golden beets. I’m going to make it to eat during the playoffs today–not your typical football-watching fare! this was hands down the best salad i’ve ever eaten. so amazing. The unhappy beets in the kitchen are about to get a glamorous makeover! Thank you. 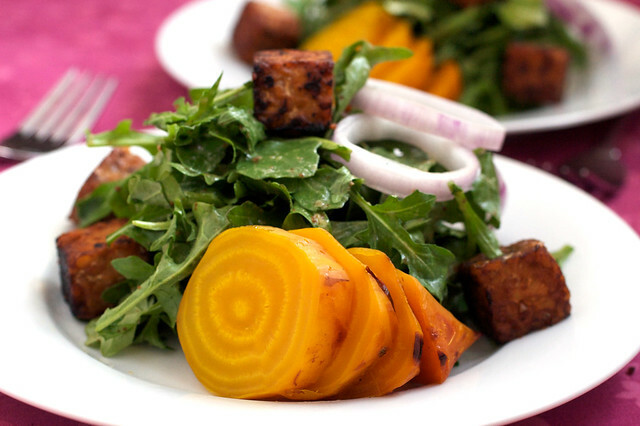 Roasted Golden Beet Salad With Warm Maple Mustard Dressing and Smoky Tempeh Croutons « the taste space – steam, bake, boil, shake! We produced Betsy’s Tempeh in Michigan for 9 1/2 years and developed a new method and now we are showing people how they too can make it at home. We are currently working on another simpler version so please stay in touch. Ok seriously, this is so delicious. I pretty much ate it while I was preparing it and skipped the arugula and red onions because of it. I loved the way the smoky tempeh set off the maple-mustard and the sweetness of the beets. Just perfection even skipping the arugula (and I am a *fiend* for arugula). Thanks, Isa! Greenest Magazine » Valentinstag-Dinner: So schmeckt’s garantiert! Vegan Thanksgiving Recipes for Every Course + A Cookbook Sneak Peek! I made this tonight and it was DELIGHTFUL and perfectly autumnal. I realized at the last minute that I was out of stone ground mustard, so substituted Dijon – it came out really, really well but I have no doubt that it would be even better with stoneground. God bless, Isa! Dude, I’ve now made this 3 times this week. Added some toasted pecans when took the salad to a level that was 100% officially OFF THE HOOK. I like everything but I really don’t like tempeh – its texture, the bitter after taste, all of it. It is my green eggs. But this recipe makes it pretty good!! The marinade is to die for. If you are squeamish about liquid smoke, use lapsang souchong tea. Steep it for 15-20 minutes and use 2/4 cup of that in place of the veggie stock. My my my!!! Whoever wrote this, you know how to make a good arcteli. Bengaluru FC, who double won India’s countrywide football group (I-League) and are owned or operated by the conglomerate Jindal THE WEST (JSW) Group, validated they would take part in the ISL rather than the I-League next season. “We’re glad our bid to participate the ISL has been accepted. Lots of time and thought has truly gone into our decision of attempting to participate the Indian Super League,” Bengaluru FC CEO Parth Jindal said in a assertion. Great Post Thanks For This Nice Info………..